Istanbul Başakşehir coach Abdullah Avci took aim at what he perceived as Burnley’s long ball football at the Faith Terim Stadium last week. But Sean Dyche, to be frank, couldn’t care less what his side have to do to win their Europa League third qualifying round tie, as long as they find a way. Dyche has long spoken of his footballing nirvana, of being able to win games in as many different ways as possible, much like Sir Alex Ferguson’s feted Manchester United sides. Burnley had just 28% possession in Istanbul, but the main statistic was 0-0, and Dyche said: “I’ve got no problem with that. I’ve said many, many times that the football we want to play is effective football. “I think you’d have a different view after the Southampton game if I chose to be that worried about it. “But that’s up to him. I’ve no problem with it. People have got to be successful in football. That’s why I think. “My personal view is to play effective football in any game. If that means making sure the ball goes on top of their centre halves, then that’s what we’ll do. Burnley have looked to be more effective in possession since surviving in their first season back in the Premier League in 2016/17, to be “fitter with the ball, as well as without it”, and they certainly didn’t look a direct side at Southampton. Dyche just wants to play winning football: “We’re only trying to press upon ourselves how to affect games, I think you get judged against the game now, what are you doing against the norms of the game? “I’m not really bothered, I’m bothered about what we’re doing, full stop. “The main thing for me is to be effective, whatever game you play in whatever sport. “It’s quite interesting, if you’re a golfer, you go ‘I’m just going to whack it as far as I can every ball’ do people say you’re not playing good golf? “If you can get it from here to the hole in less shots than everyone else, that’s what it’s all about. “Everyone saying ‘no, no, you can’t do it that way’. “There’s no reason - so we’re not allowed to kick it down the pitch and head it in the goal? “Last season, our centre halves factually had the most headers in the whole of the Premier League. That means the opposition must be putting the ball in the air somewhere along the line, or our defenders are heading it on the floor. He added: “On any given day, what is the best chance of opening up a game? Against Southampton, they were very offence minded, retreated early, got numbers behind the ball early, so you need to find a way of breaking that down. “Can we play in between, shift and slide the ball quickly across the pitch to get into aggressive attacking positions? Yes we could. “On another day, against a high back line, why would you not put it in behind them? “If the opposition are really good at keeping the ball and being progressive with their passing, are you going to beat them at their game? Probably not. “Can you beat them in a game they’re not used to? There’s a chance. “If you look at it in its simplistic, common sensical format, then it makes sense. 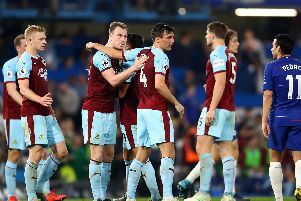 Dyche doesn’t have a philosophy, and can’t understand what a ‘right way of playing’ is, other than playing to win: “I’m not a zealot, the right way of playing, there’s a balance. “Imagine Sky Sports saying Man City are a disgrace, too many short passes. Disgusting. But people say you are for kicking the ball long. “People can decide whether we do or not, I’m not bothered. I want my team to win, and if we can’t, get a draw. If we can’t draw, at least play in a manner which was trying to win. Whatever way his team take on a game, you are guaranteed a framework which gives them a solid base, and Burnley have conceded only twice in four competitive games so far this term. He feels the best teams are solid, and can also pose an attacking threat: “Contrary to popular belief, the footballing sides are organised. Man City are thoroughly organised, ready to press, ready to work - that’s their biggest breakthrough for me, the reason they won it by so massive a margin. “They did all the ugly stuff as well as the beautiful stuff, and that’s a real team. “Lots do teams do one or the other, but what about the team that can do both? They’re not far off it. “Sir Alex’s teams could do everything, they could hurt you in every way, soak it up, counter, hurt you with a set piece, individual talent, beautiful football...they’re still the best I’ve seen. “I never remember him going out and saying ‘we play the right way’, I can remember him saying e play a way to win, and they did that a lot. “I can’t remember him saying he was reinventing football, ever.